Make no mistake about it. 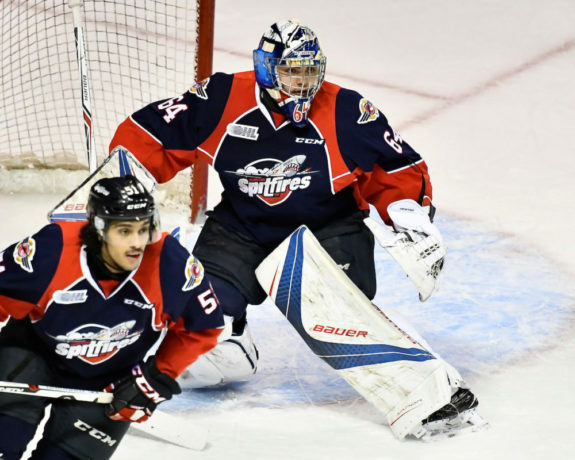 The Erie Otters’ 4-3 loss to the Windsor Spitfires in the Mastercard Memorial Cup Final was by far their most crushing defeat of the season. They were among the last two teams out of 60 in the Canadian Hockey League. It was one game against a familiar foe in their building. All the Otters needed to do was win, no matter what it took. The Otters held leads of 2-1 and 3-2, which were the first times all tournament that the Spitfires trailed in a game. The 3-2 goal came when the Otters’ fourth line was on the ice. Maybe that was the thing that would finally give them the momentum to cross the finish line. Give credit to the Spitfires for pushing back each time they trailed. A Graham Knott power-play goal tied the score at three heading into the second intermission. Each team potentially had 20 minutes to win the Memorial Cup. It setup a memorable finish. Spitfires’ Aaron Luchak scored early in the third period to take a 4-3 lead. Then Windsor played defense the rest of the night hoping to keep the Otters from tying the game. The drama in those last few minutes had to be cut with a knife. It made for great theater, especially when the Otters put immense pressure on the Spitfires late in the game. And then, the defining moment of the game came off the stick of 65-goal sniper Alex DeBrincat. He beat Michael Dipietro with his shot, only to have the puck hit the inside of the far post. The Otters were that close to tying the game. It didn’t happen. The Spitfires survived the last onslaught and skated off their home ice as Mastercard Memorial Cup champions. You could see the disappointment in the Otters after the buzzer sounded. The image of Dylan Strome on his knees with anguish in his face said all you needed to know about how crushing this defeat was. This was their last opportunity to make good on their all-in. They fell one goal short. One look at the Otters’ bench afterwards showed a team who gave everything they had to win this one game. As the camera went by, goaltender Troy Timpano threw his stick towards the cameraman. He later apologized for it. He expressed how the team felt in that moment with one throw of his stick. This is going to hurt for a while. They had opportunities presented to them but couldn’t fully take advantage of them. As heartbreaking a loss as this game was, it takes nothing away from everything the Otters did not only this season, but the three seasons before as well. Once the pain subsides, this team has so much to be proud of. 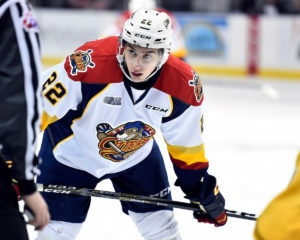 What the Erie Otters did this season was nothing short of remarkable. Hardly anybody had them in the conversation to make a playoff run let alone make the Memorial Cup Final. Timpano came in and couldn’t lose to start the season. That put the Otters in a position to do something life changing, not only for themselves, but for the fans and for Erie. If the Otters were seriously considering making a run at the Memorial Cup, they needed to make some moves. General Manager Dave Brown made moves, bringing in Warren Foegele, Cameron Lizotte, Anthony Cirelli and Owen Headrick. The Otters transformed from a good team to the favorite to win it all. They Otters swept the Sarnia Sting out. They then had one of the most defining moments in their history by winning Game 7 against the London Knights in overtime to get past the second round. They then dispatched the Owen Sound Attack in six games to win the hardest conference in junior hockey. All that was left was win a series against the Eastern champion to win the Ontario Hockey League. The Otters defeated the Mississauga Steelheads in five tough games to cement their legacy. They were OHL Champions. The hours, days, weeks, months and years of preparation all came together in one sweet moment on their home ice. They won the title in front of their fans. This is where the true impact of this improbable run will never be forgotten. Before this run came together, there were serious questions about the future of the team. Rumors kept flying that the Otters might leave Erie. With the Otters winning just 10 times in 2011-12, those questions couldn’t be avoided. Then to Erie a savior was given. 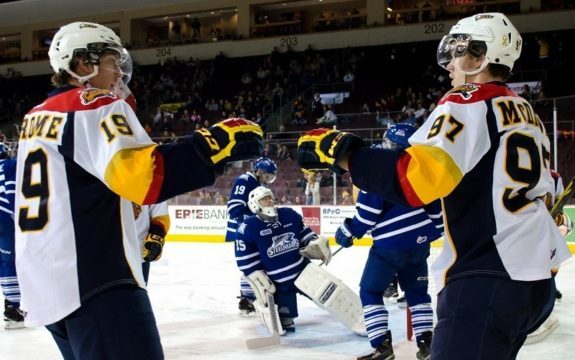 Connor McDavid came to the Otters at the exact perfect moment. It was a sign that the franchise was finally going to rise up from the ashes. Fans knew this, but were still skeptical. When you see your team lose 58 games out of 68, you can’t blame them for carrying a seeing is believing mentality. After 19 wins in McDavid’s rookie season, the Otters started on a path that no team in CHL history has ever done. They won 50 games not just once, or twice or even three times in a row. They won 50 games in a remarkable four seasons in a row. Even still, fans wanted a championship. Despite the regular season success, the Otters could never finish the deal. In 2013-14, the Otters went to the Western Conference Finals only to lose in five games. 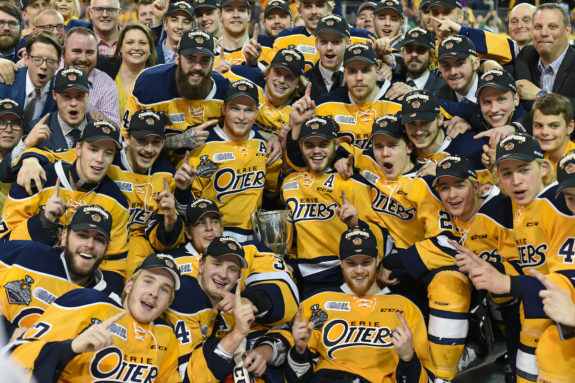 The following season, the Otters made the OHL Finals, only to lose in five games. In 2015-16, they made the Western Conference Finals again, only to lose in four straight. In each occurrence, they lost to the OHL representative in the Memorial Cup. They kept falling short. It’s no wonder many didn’t expect major things to happen this season coming in. Fans were hungry for a championship, but weren’t sure when they’d get one. Even though the Otters lost to Windsor in the Memorial Cup Final, they did something this season they couldn’t do the other three seasons. They won a championship. Fans who stuck by them throughout and new fans embraced this team like I’ve never seen before. This is where the story actually begins, not where it ends. The bond between the Otters and their fans will never be forgotten. Although the Otters will lose incredible talents such as Strome, Darren Raddysh, Kyle Pettit, Warren Foegele, Anthony Cirelli and others, the work that this group did cannot be understated. First, they helped fans fall back in love with their hockey team. Gone are the questions of relocation thanks to their success and strong foundation in management. Erie has always been a hockey town. It’s never been stronger than today thanks to this team. They’ll watch these players as they develop in the pros. When you see fans watch the Coyotes for Strome, or the Lightning for Cernak, Cirelli and Taylor Raddysh, or the Red Wings for Jordan Sambrook or the Hurricanes for Foegele, you’ll understand why. There’s an unbreakable bond. Once an Otter always an Otter is stronger than ever. Second, they laid the foundation for future success. This isn’t over by any stretch. Sure, the team has questions this offseason as does everyone else. But the next wave is set to carry on the Otters’ tradition. They might not win 50 next season given who’s leaving the team. That’s ok though. The important work is done. The Erie Otters are on the hockey map thanks to this core group. When you don’t hear concerns of players not wanting to come to Erie, you can thank McDavid and Strome for making Erie desirable. And that’s what we will remember about this season’s Erie Otters. We didn’t expect much. They became champions while accomplishing a more lasting task. Captain Strome couldn’t have said it any better after their crushing defeat on Sunday. This is the kind of thing that cements a legacy. For Strome, he had many bumps in the road. He overcame them to help this team win a championship. He will forever be remembered as the captain in Erie who took the Otters to a title. He also won the Mastercard Memorial Cup MVP in a losing effort. His number 19 deserves recognition in the rafters at Erie Insurance Arena. Losing in the Memorial Cup Final will sting for a while. But when it settles down, the Otters can look back and be proud of what they’ve accomplished. No matter what happens in Erie moving forward, it would never have been possible without this group and their sacrifices. When we think of the golden age of Erie hockey, we’ll think of these last four seasons and remember that the Otters did something nobody has ever done before in the CHL. One cannot measure the value of this impact. Take heart, Otters’ fans. The story of Erie hockey is only beginning to take shape. Although it’s the end of this core group, the best is eventually yet to come. So for all that, I think I speak for Otters’ fans everywhere by saying “thank you.” Thank you for your effort. Thank you for your sacrifices. Thank you for making Erie relevant again. You will never be forgotten and will always have a place in our hearts for the rest of time.